This calculator will calculate the rate and expense amount for an asset for a given year based on its acquisition cost, salvage value, and expected useful life -- using the double declining balance method. Note that if you would like an answer to "What is Depreciation? ", or you would like to calculate straight line depreciation, please visit the SLD Calculator. Or, if you would like calculate or learn about the Modified Accelerated Cost Recovery System (MACRS) method, please visit the MACRS Calculator. Calculate double declining balance depreciation rate and expense amount for an asset for a given year based on its acquisition cost, salvage value, and expected useful life. If you would like the name of the asset, or General Asset Account (GAA), included in the title of the depreciation schedule, enter the name in this field. Enter the total cost to acquire the asset, or the adjusted basis. Enter the amount without dollar sign or any commas. Enter the expected salvage value (also known as residual value) of the asset at the end of its recovery period (without dollar sign or commas). If you expect the asset to be worthless at the end of its recovery period, enter a zero. Note that the double declining balance method ignores the salvage value for as long the book value remains higher than the salvage value. Enter the number of years you expect this asset to be in service for. Note that in order to depreciate the asset it will need to be in service for more than 1 year. Enter the 4-digit year you would like the calculator to calculate the depreciation expense for. This is the difference between the acquisition cost (adjusted basis) and the salvage value. This is the double declining rate used by the calculator for the selected year. If the selected year is either the first or final year, the percentage will be prorated based on what month of the year the asset was placed in service. This is the calculated depreciation expense for the selected year. If the selected year is either the first or final year, the depreciation expense will be prorated based on what month of the year the asset was placed in service. Enter the purchase cost the property, not including the value of any land that came with it. Enter the asset's estimated salvage value at the end of its useful life. Enter the number of cost recovery years. Select the month and enter the 4-digit year the asset was first placed in service. Enter the 4-digit year you would like to calculate the depreciation expense for. 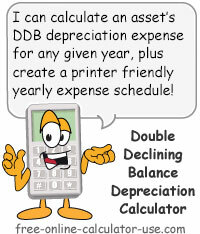 Click the "Calculate DDB Depreciation" button and scroll down to see the results, which will include a button for creating a "Printer Friendly Schedule". What the double declining balance method is and how to calculate it. What is Double Declining Balance Method? The Double Declining Balance (DDB) Method is a system designed to accelerate the cost recovery of an asset's depreciable base. After all, most assets depreciate faster in their early years of service, and slower in their later years of service. The DDB method addresses that notion. In fact, as the name suggests, the DDB method results in a first-year depreciation expense of double the amount that could be expensed using the straight-line method. However, due to the way it's calculated, the DDB method of depreciating an asset rarely fully depreciates the asset by the end of the recovery period. Therefore most companies switch to the straight-line method during the final year(s) of the recovery period in order to fully depreciate the asset. Another thing to keep in mind is that unlike the straight-line method, the DDB method ignores the salvage value in its calculations -- unless taking the full DDB depreciation for a given year would cause the book value to drop below the salvage value. In that case, only the excess of the depreciable base may be expensed for that year. To calculate DDB, you first calculate the straight-line depreciation (SLD) expense percentage based on the acquisition cost (adjusted basis) of the asset -- while ignoring the salvage value -- and then double that percentage to arrive at the DDB percentage. For example, if you purchased a machine costing $10,000, with a salvage value of $1,000 and a useful life of 5 years, the SLD rate would be equal to 100% divided by 5, or 20%. Next, double the SLD rate to get the DDB rate, which in this case would be 40%. Therefore, the first year depreciation expense for the $10,000 machine would be equal to $4,000 (.40 X 10,000) -- provided the asset was placed in service on January 1, of that year. For all remaining years, the DDB depreciation expense would be calculated by multiplying the book value (acquisition cost minus accumulated depreciation) by the 40% rate -- except in the case where that result would cause the book value to drop below the salvage value. Referring to back to the machine example discussed earlier, if you expect the $10,000 machine to last for 5 years, with a salvage value of $1,000.00, and you place the machine in service in July of 2012, here is how you would calculate the double declining depreciation expense for the applicable years. Step 4: Subsequent years depreciation expense = book value * 40%. Step 5: If necessary, adjust depreciation expense to preserve salvage value. In the last line of the above depreciation schedule, you will note that the depreciation expense was adjusted downward so as not to depreciate the machine beyond its salvage value. Please note that both the Straight-Line Depreciation Calculator and the Double Declining Balance Calculator are basically included here as learning tools and do not necessarily calculate depreciation in accordance with the IRS's Modified Accelerated Cost Recovery System (MACRS) methodology. For that you will want to visit the MACRS Depreciation Calculator.